Saturday, June 23, 2018, 1 – 4:30 p.m. 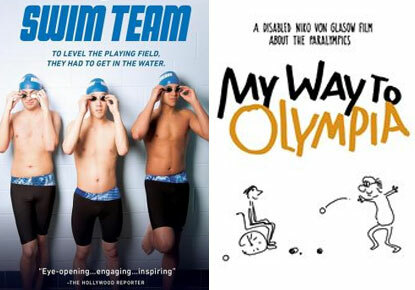 In celebration of the 2018 Special Olympics USA Games, which will take place in Seattle from July 1st through July 6th, please join us for a double feature presentation of "My Way to Olympia” and "Swim Team." "My Way to Olympia" by Niko von Glasow: Who better to cover the Paralympics, the international sporting event for athletes with physical and intellectual disabilities, than Niko von Glasow, the world's best-known disabled filmmaker? Unfortunately — or fortunately for anyone seeking an insightful and funny documentary — this filmmaker frankly hates sports and thinks the games are "a stupid idea." Born with severely shortened arms, von Glasow serves as an endearing guide to London's Paralympics competition in My Way to Olympia. As he meets a one-handed Norwegian table tennis player, the Rwandan sitting volleyball team, an American archer without arms and a Greek paraplegic boccia player, his own stereotypes about disability and sports get delightfully punctured. "Swim Team" by Lara Stolman: Parents of a boy on the autism spectrum form a competitive swim team, recruiting other teens on the spectrum and training them with high expectations and zero pity. Swim Team chronicles the extraordinary rise of three diverse young athletes, capturing a moving quest for inclusion, independence and a life that feels like winning. "My Way to Olympia"- 60 mins., "Swim Team" - 90 mins.